Ali is a watch collector in Toronto. Like myself, he loves Formula 1 and started with TAG Heuer. Here is my Q&A with Ali. Are you enjoying the current “boom” in watchmaking and the recent surge in popularity of mechanical timepieces? Or would you prefer that watch collecting was still the realm of a small number of fanatic connoisseurs? What was the last timepiece you acquired and what is the next timepiece on your radar? 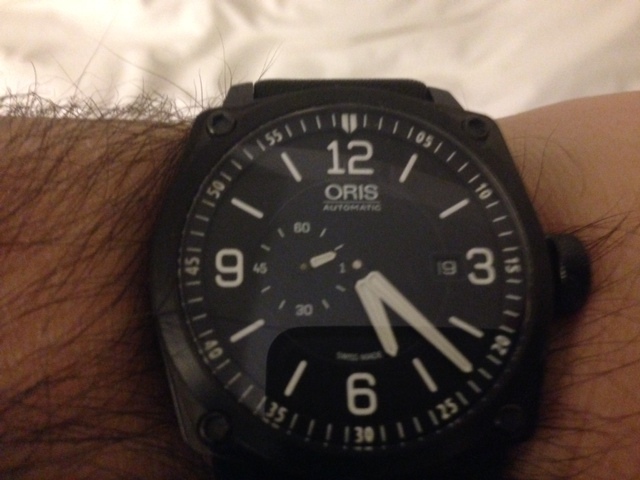 Last purchase was an Oris BC4 Auto – had the modern look which I could wear for almost any occasion, I wear it more than any other watch in my collection – I’m enjoying the piece. My next purchase…I’ve been looking at the Longines Hydroconquest with red/black dial on steel strap. Would like to add this piece to my collection due to its versatility ‘for all occasions’ – and has the looks to match. Which “up-and-coming” brands are you following? Clerc. Although not a new company by any means, they haven’t received the attention like the big name brands have. Their watches provide a winning combination of style/originality and functionality. Their Hydroscaph line in my opinion are among the best looking watches ever produced. A little out of my price range but nice to dream a little. Which brand have you never owned, but would like to own? Perhaps not the specific brand but a model which I would like to own would be a watch in IWC Pilot Watch line – one piece that caught my attention and that I keep going back to as my next dream piece – Chrono Top Gun. In 2nd place, anything Jaeger. Which aspect of a mechanical timepiece do you enjoy the most? Was there ever one defining moment that got you “hooked” on watches? How would you describe your taste as a collector? Value collector. I enjoy popular ‘mainstream’ names like Tag H., Longines, B&R due to the level of quality and style at an affordable price but won’t rule out a purchase or two in the mid to high price ranges ie. Omega, Panerai if the opportunity comes along. If you were going to design your very own fantasy timepiece, which features and functions would it have? How many hours per week do you spend reading about watches or viewing watch-related websites? Depends on the week – I would say between 2-3 hours per except when I’m on the hunt for a new watch. Then about 48 hours per week (not including weekdays). Would you ever wear a smartwatch?